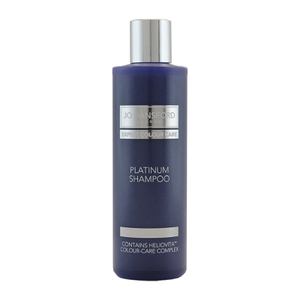 Jo Hansford Expert Colour Care Platinum Shampoo has been developed for blonde, highlighted or grey hair. Suitable for daily cleansing, the mild shampoo has been formulated with violet colours to neutralise yellow or brassy tones and remove discolouration, revealing refreshed, radiant hair. With a Heliovita™ Colour Care Complex that allows you to achieve salon style results every time, the luxurious shampoo is enriched with nourishing pomegranate oil and sunflower seed extract to shield hair from oxidation and UV radiation. The Prodew Amino Acid Blend strengthens strands and provides colour protection, whilst repairing damage to leave you with healthy-looking locks. Sweet Blue Lupin Peptides have been scientifically proven to keep hair colour-fast for up to thirty washes and Keratec, a unique keratin-based ingredient smoothens the cuticles so you can experience sleek, silky soft locks. E.N. Apply to wet hair and gently massage into hair and scalp. Rinse thoroughly. Repeat if necessary.